The latest HD television technology is called 4K, or Ultra High Definition (UHD), sometimes also called 4K UHD. Previously, there were three ways to describe definition in TV: Standard Definition (480p/540p), High Definition (720p), and Full High Definition (1080i/p). By contrast, UHD is 2160p. 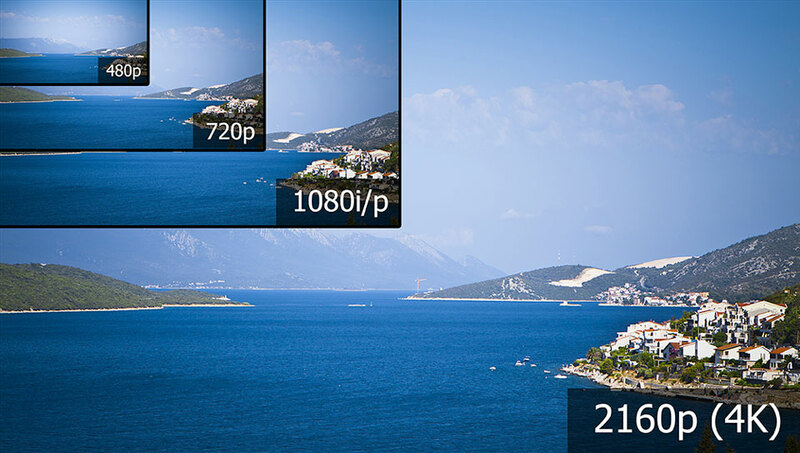 Each UHD TV has a minimum resolution of 3,840 pixels wide by 2,160 pixels high. Essentially, a UHD TV has about 8 million more pixels than a 1,080p HD television. While more pixels result in a better picture, most broadcasters and streaming services have not yet converted. Why? Because 4K video takes up much more space on a hard drive, and streaming it eats up a large amount of bandwidth—in fact, people who wish to stream 4K content like House of Cards on Netflix will need a 25mbps download speed that many viewers don’t currently have. While there has been talk of broadcasting the 2016 Olympic Games in UHD, the current options for true UHD content are limited to some content on a few streaming services, mainly Netflix and Amazon. Despite the limited programming currently available for UHD, 4K televisions are still flying off the shelves. While there will be more shows available in the future, another selling point is “upconverting”—changing an HD 1080p signal, for example, into a 4K image. This is done by using additional pixels to recreate the fewer-pixeled original image. To do this, the television guesses at what should go in those extra pixels; often the result is an image slightly sharper than 1080p, but still softer than true 4K UHD. So while upconverting results in a good picture, and possibly a better picture than you would have had with regular HD, most people won’t reap the full benefits of their new 4K sets until they watch UHD programming. What Does This Mean To My Future Journalism Career? When you graduate and begin working in the field of broadcast journalism, presumably some time in the next few years, you may work for a broadcaster that is making the switch to 4K UHD. If not, it’s likely your employer will do so eventually. In the meantime, UHD TVs and cable/satellite providers will be upconverting your video. So I Should Get Ready for My 2160p Closeup? Yes, but not just you. Remember that everything shot in 4K and, to a lesser extent, upconverted to it, will be seen in greater detail. If you currently intern at a TV station, some of the journalists you work with might remember the transition from standard definition to HD several years ago. At that time, many on-air reporters and anchors were advised to rethink their makeup strategies. Some stations even hired skincare experts to advise on-air talent how to improve their look in HD. While you don’t need to do anything that extreme, you should be prepared for a very sharp picture if you plan to work on-air. When shooting video for class, experiment with closeup shots in different angles and lighting situations, so you can get an idea of how you look your best. You can also try different kinds or amounts of makeup. If you can borrow a 4K UHD camera, you’ll have an even better idea of how things look in the new medium. Shooting video in UHD (if you have the opportunity) is a good idea even if you don’t plan to be in front of the camera yourself. Future photographers and editors will need to know what works and what doesn’t when shooting in 4K. A few years from now, you might be capturing video both indoors outdoors, at varying times of day or night, in varying weather conditions. You’ll need to use the right lighting techniques and camera angles to capture images for UHD. Remember that too-harsh lighting, combined with too many pixels, can result in an image that’s either too blurry to see clearly or downright blinding to view. If you don’t have access to a UHD camera, see if your school has a 4K TV where you can stream UHD, so you can see examples of video shot in 2160p. Also check your phone, or your friends’ phones—many new cell phones can now shoot 4K video. While most phone cameras won’t have half the features of a dedicated video camera, you may get some ideas about shooting in UHD. Remember that whether you take video with a dedicated video camera or a cell phone, you’ll need a decent amount of storage space for any video longer than a few minutes. Because UHD uses so many pixels, it uses a lot more storage space than HD. If you can shoot in 4K, consider investing in a larger memory card than what you have currently. Also be prepared for slow upload/download speeds when working with UHD in a future broadcast journalism job. Hopefully this will improve as internet speeds become faster. However, after graduating, you may work at a station that’s still improving its technology for 4K or waiting for its ISP to offer higher speeds. This might mean that you’re asked to upload only a few minutes of video at a time, instead of sending back fifteen minutes of cover video for the producer to pick through. You may also be required to do more editing in the field so you can just send back the final 30- or 60-second package.